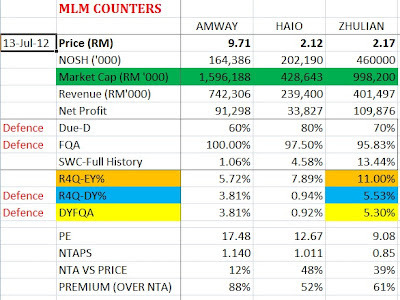 Look like ZHULIAN is getting higher in price (as compared to my analysis in year 2010) but the PE is getting lower. I.e. It may be seriously undervalued and price should follow the Value soon. Hi, it's hopeful news. I'd like to share. It's true that you can make more money in other business, no doubt about it & most billionaires are from other industry. MLM for me is not about﻿ super super rich but you can become super rich in MLM, to get the total FREEDOM IN LIFE. Choices are in each person's hand, you had 14 years of experience in MLM, but you didn't "make it" in MLM, it's not because of the industry, but rather it's components: companies, products, support, plan and the most important component is ourselves. it's going to never go above 50% anymore. gauteng province geda 2007 ought to be further stimulated and adapted with aspects of south africa.